There are a variety of ways to serve right here at Northaven. On Sunday mornings we are always happy to have volunteers join our Door Greeter and Welcome Center rotation. Volunteers also answer our phones in the office Monday through Friday. 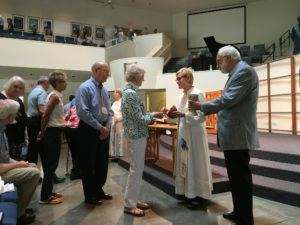 Our Care Team has groups of people who volunteer to take Communion once a month to those who cannot be in worship, as well as provide meals and transportation for those who need assistance periodically. There is something for everyone and the best way to find out where you might enjoy serving is to contact Mahlon Hight, Minister of Congregational Life and let her know you are ready to become a Northaven volunteer! Lay Reader/Liturgist —Assist in worship by reading a portion of the liturgy or a scripture passage. Sign up here. Communion Server — Serve communion, which is typically held on the first Sunday of the month. If you would like to serve communion, which is typically held on the first Sunday of the month, sign up here. Please sign up for one Sunday so that others may have an opportunity to serve. Acolyte —For children and youth in grades 3-12. Sign up here. Usher — Greet people as they enter the sanctuary, pass out bulletins, collect the offering, ensure a smooth flow during communion and more. For more information email Mahlon Hight. Sound and A/V Technician —If you either have experience mixing audio successfully in the live environment OR are willing to attend training and work alongside a mentor. For more information contact Stephanie Rhoades, stephanie@northaven.org.